This Barbecue Grill features a simple, clean design and a generous cooking surface. 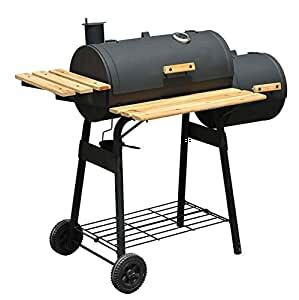 It contains a porcelain coated steel plate grill, runs on charcoal, and comes with a shelf that offers additional space for condiments. The BBQ features adjustable dampers for airflow control, and sliding grates for easy access to the coals. It also has a steel wire storage shelf on the bottom for easy access to charcoal and other items. Designed to hold up to 12 burgers at a time, this unit is the ideal choice for daily gatherings and will fit right into any backyard or outdoor entertainment area you own. This Barbecue Grill features a simple, clean design and a generous cooking surface. It contains a porcelain coated steel plate grill, runs on charcoal, and comes with a shelf that offers additional space for condiments. The BBQ features adjustable dampers for airflow control, and sliding grates for easy access to the coals. It also has a steel wire storage shelf on the bottom for easy access to charcoal and other items. Designed to hold up to 12 burgers at a time, this unit is the ideal choice for daily gatherings and will fit right into any backyard or outdoor entertainment area you own. If you are looking for a nice charcoal grill, this is the grill you have been waiting for.